A TEENAGER from Woking has found new independence and freedom after being presented with a powered wheelchair. The chair was bought for 14-year-old Thomas Dring thanks to the fundraising efforts of customers and staff at a gaming centre. 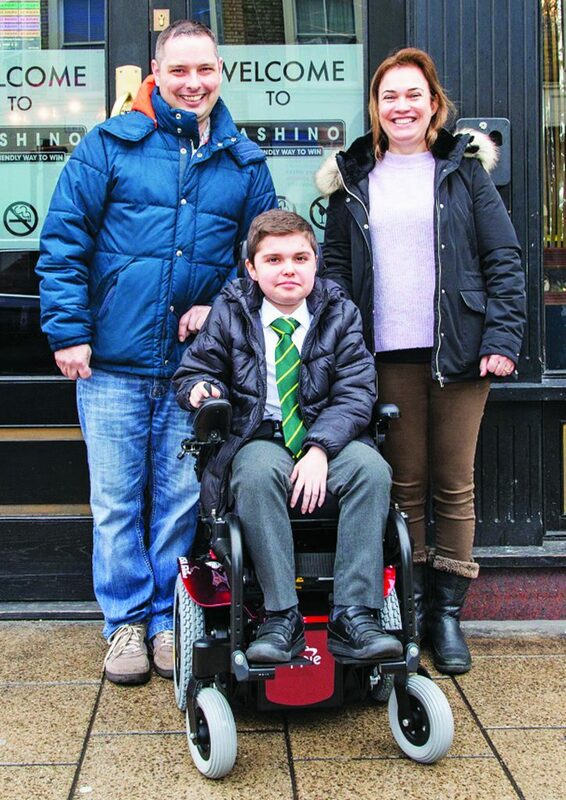 Thomas, a pupil at Gordons School at West End, suffers from Duchenne Muscular Dystrophy, a genetic disorder that causes muscle degeneration and weakness. His wheelchair was provided thanks to Cashino Putney, one of the main fundraisers for the charity CHIPS. CHIPS was set up on behalf of the casino and gaming industry to provide specialised powered wheelchairs for children with severe mobility problems. Thomas’s mum, Solange, said: “Thomas can only walk short distances and tires very quickly. He has an NHS wheelchair that is in reasonably good condition but, unfortunately, he’s outgrown it. CHIPS, through fundraising which includes contributions from Cashino and its parent company Praesepe, has so far raised more than £2.2m, enabling the charity to present over 520 wheelchairs to children throughout the UK.